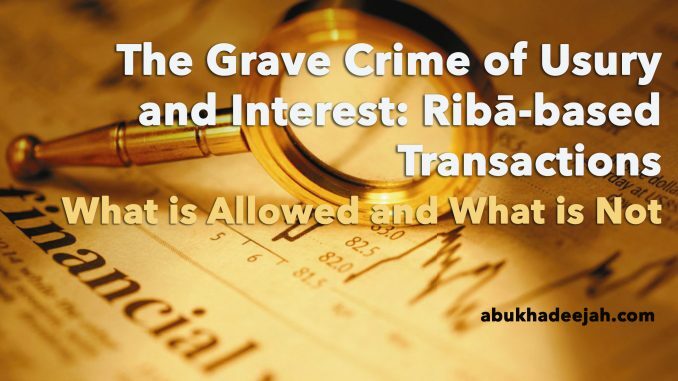 The Grave Crime of Usury and Interest: Ribā-based Transactions: What is Allowed and What is Not..
Usury (Arabic: ribā) is an increase in gain to either one of the two parties in a transaction when trading the same currency or the same type of merchandise specified in the Prophetic narrations. Ribā or usury is forbidden by revelation and consensus (ijmā’). Paper money and currencies take the same ruling as gold and silver. 1. Usury added to a loan (i.e. interest). So usury is added to a loan in accordance with the length of time one takes in returning the borrowed amount of currency. This is commonplace in these times and usually takes place through banks. So these are the six things that ribā (usury) applies to, and whatever else is intended to refer to them (e.g. paper currency in place of gold and silver). b) Ribā An-Nasī’ah (usury of delay): This is where one type of currency or commodity (as specified in the previous narration) is sold for the same type of currency without any increase, however taking possession of the currency or commodity is delayed. So if one sells one Dīnār for one Dīnār, or one gold coin for one gold coin, or two kilograms or wheat for two kilograms of wheat, but the possession of the currency or commodity is not taken there and then, or it is said by the two parties, “Let us delay taking possession”, then this is usury, even if there is no increase in payment from either side. Likewise, it is forbidden for the one selling silver in exchange for gold, or gold in exchange for silver, or wheat in exchange for barley, or dates in exchange for barley, etc. to take possession at a later date, even if the agreement is made there and then – this is a usury-based transaction. So this makes clear the definition of usury (ribā) in Sharī’ah law. 1. It is allowed for a person to buy a sack of sugar for $150 to be paid for at a later designated time, that costs $100 now. There is no problem with such a transaction and its permissibility is like an ijmā’ (agreed upon) between the Muslims. It is not ribā’ (usury) and both parties are pleased. The buyer is pleased with the increase because he does not have the ability to pay upfront – so the delay allows him to take possession of the item and pay later. The seller is pleased because he gains benefit from the increased price he has charged. The Prophet (ﷺ) commanded Abdullah Ibn ‘Amr Ibn Al-‘Aas to prepare an army, so he would buy one camel for two camels that would be repaid at a later date. Ibn ‘Uthaimeen said, “If a person buys something for an amount that is to be paid later which is more than its current price, there is no harm in that. Shaikhul-Islām Ibn Taymiyyah reports ijmā’ (unanimous agreement) concerning its allowance among the Muslims.” With the condition that the amount is known, and the period of repayment is known and no increase is introduced thereafter. 2. It is allowed to sell goods (such as grain) for a cheaper price than usual for a delay in delivering the goods. So the money is paid in advance and the goods are delivered at a later date. In this, there is ijmā’ too. There is a similarity in the two transactions in that in both there is a delay. In the second, there is a delay in delivering the product. In the first, there is a delay in paying for the delivered item. 4. It is prohibited to enter into al-‘īnah transactions. This is a deceptive way of dealing in usury (ribā). This is where a person buys a product from another for a price to be paid later. Then, he sells it back to the seller for a price that is less than the original price that he bought is for – and he takes the cash away with him, whilst still owing him the original amount to be paid back later. This transaction is ribā and is prohibited in numerous narrations. Example: Seller (Abdullah) sells a sack of rice for $150 dollars to a buyer (Steven) where both have agreed that Steven will pay Abdullah in 1 year from date of the transaction. Then Steven sells the sack of rice back to Abdullah for $100. So Abdullah pays Steven $100 which he takes. However, Steven still owes Abdullah $150 which he must pay him in a year. So you can see what has happened here is a usury transaction where the intent was an interest-based loan. In this case, the sack of rice was used merely a tool to justify Steven borrowing $100 dollars from Abdullah to pay him $150 dollars back in a years time. This is prohibited. The example used in point (3) is the tawarruq transaction. It is different to al-‘īnah. That is because the buyer in the tawarruq transaction buys the product from a person (on credit) to be paid later – and then he sells it to someone else for cash due to his need for money. There is no deception in this and it is not ribā because the person who bought it from him is not the original seller. 5. It not permitted to sell what a person does not own, and then buy the product and give it to the buyer. It is also not permitted to buy a product and then sell it while it is still at the place of the original seller before he has taken legal possession of it. Both of these acts are forbidden. Hakīm Ibn Hizām asked: “O Messenger of Allah, a man came to me and wants me to sell him something which is not in my possession (I do not own it). Should I buy it for him from the market?” He (ﷺ) replied, “Do not sell what you do not possess.” (Abu Dāwūd 3503) and he (ﷺ) said, “It is not allowed to combine a sale and a loan in one, nor is it allowed to sell what you do not own.” (Abu Dāwūd, 3504). He also said, “Whoever buys food, let him not sell it until he has received all of it into his possession.” It is also confirmed from the Prophet that he prohibited a product to be sold in the same place it was bought until the buyers take possession of it and take it to their places. So it is obligatory to delay selling a product until he has purchased it and taken legal possession of it. It is therefore clear that which many people do of selling goods while they are still in the place of the initial seller before they are transferred to the buyer or to his storage is an affair that is forbidden as it opposes the command of the Messenger (ﷺ). 6. That which is prevalent in societies where the one who owes a debt and does not pay it on time, so he is charged an increased sum so that he can have more time – then this is ribā (usury or interest) and is forbidden. This is the usury of the people of pre-Islamic ignorance – they would say to the one who owed the debt, “Either pay up or pay interest!” So Allah forbade that and said instead, “And if the debtor is going through difficulties, then grant him time until it is easy for him to repay.” (Quran 2:180) There is a unanimous agreement (ijmā’) upon the forbiddance of every transaction that tries to make this increase permissible. 8. It is forbidden to enter into a loan that involves increase: either a percentage increase annually (or monthly) or an unrestricted increase or a fixed increase. For example, a person loans someone $1000 under the condition that he repays him $1200. Or that he agrees to repay him the exact $1000 but the one who loaned him the money will use his car or live in his home. These increases are forbidden are are ribā (usury). Another example is where a person who gives a loan stipulates that he be given some fixed amount of profit each month, or each year for the privilege of his wealth being used by the person who took the loan. 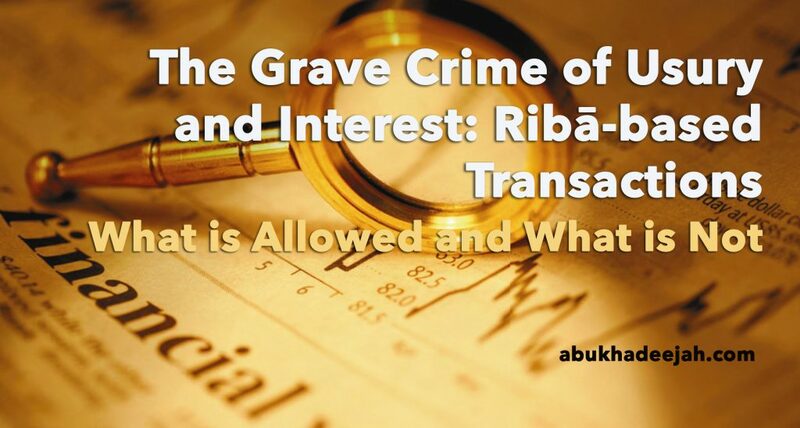 This is forbidden ribā too as it involves increase on a loan, regardless of whether it is called a loan or a ‘trust’ – it is usury. However, if the two parties enter into a limited partnership (Mudārabah or Qirād) where some of the profits of the partnership come to one party and rest to the other. This is permissible by ijmā’ (agreement) of the scholars. That is because both parties share in the profit and the loss, and the original money in this contractual partnership has the ruling of a trust in the possession of the worker. If it is lost without any negligence by the worker, then he is not held responsible – and he gets for his work the share that was agreed upon in the contract. 9. The ruling on increasing payment in a sale on credit and instalment payments: Selling goods for a delayed payment to be paid at a designated time is permitted as long as it is a contractually agreed condition. Instalment payments are also permitted on the price of the product as long as the amounts are clearly known and fixed beforehand, and the times of the repayments are known and designated. This is due to the statement of Allah, “O you who believe, when you contract a debt for a fixed period, write it down.” (Qur’an 2:282) And due to the saying of the Prophet (ﷺ), “Whoever gives an advance in trade, then let it be a known measure, a known weight and for a known period of time.” (Bukhāri 2240, Muslim 1604) Also due to the story of Barīrah that is reported in Bukhāri and Muslim when she bought her freedom from her masters for 9 awāq (silver weights) to be paid annually at one uqiyah per year. The Prophet approved of it and did not object to this transaction. There is no difference in permissibility between an amount being paid all at once upfront or an extra sum added due to a delay in paying for the goods at a later known and designated date. 10. From the above: It is allowed therefore for a trader to sell a product on a fixed term of payment that is paid to him over time – even if the price of the sale on credit is increased from its original value. For example, a person wants to buy a washing machine from a shop. Its price is $500. The customer cannot afford to buy it there and then. So the shop-keeper offers him a deal: to sell it to him for $700 with the condition that he will pay him $100 each month for seven months. Both the shopkeeper and the customer are pleased and they sign a contract to that effect, and the customer takes the goods into his possession legally. The customer is now in debt to the shopkeeper. It is not allowed for the customer to sell the washing machine to someone else without first taking it away to his own place (home, workplace, etc). The customer must take the debt seriously. The Prophet (ﷺ) said, “Whoever takes the wealth of the people and he fully intends to pay it back, Allah will pay it back for him. And whoever takes the wealth of the people with the intent of ruining it (and not returning it), then Allah will ruin him.” (Bukhāri 2387). 11. If the shopkeeper in the example above uses a bank or a finance company as a third party from whom the customer takes a loan of $500 to repay back to the finance company $700 over seven months, then this transaction is harām (impermissible) and based on interest (ribā). That is because the customer has agreed to borrow $500, and to pay back $700 – that is clear ribā. As mentioned above, currencies and money take the same ruling as gold and silver. So for example, it is not allowed for a seller to exchange 2 silver coins in return for 4 silver coins in delayed payment. So when one buys goods from a retailer (as in point 10), the contract should be for the item purchased and not for any money borrowed. 12. It is allowed to pay in advance for something which will be delivered at a later date so long as it is clear what is being paid for and the amount being paid. Ibn ‘Abbās narrated that Allah’s Messenger (ﷺ) said, “Whoever pays for something in advance then let him pay for a specified measure, a clear and specified weight for a specified time.” (Bukhāri 2240, Muslim 1604). 13. The Prophet (ﷺ) said, “Do not do what the Jews did by seeking through trickery to make lawful things that Allah prohibited.” (Irwā al-Ghalīl 5/375, no. 1535) A person says to another, “Go ahead to a car dealership, choose a car and I will buy it. Then I will sell it to you on instalment payments.” Or he says, “Go look for a house that is on sale that you like, and I will buy it. Then I will sell it to you on instalment payments.” Ibn Uthaimeen stated that these are methods of trickery employed to indulge in ribā (usury). The businessman who purchases these items does not do so as an act of charity to ease another’s hardship. He only buys for the purpose of gaining the increase of return payment through instalments from the one in need. Ibn ‘Abbās was asked about a man who sold another a piece of silk cloth for 100 dirhams to be paid at a later date. Then he buys it back from him for 50 dirhams. So Ibn Abbās said, “This is selling dirhams for dirhams for an increase (i.e. ribā) but they used a piece of silk between them (in order to justify the transaction).” Ibn al-Qayyim said, “This is ribā, the forbiddance of it follows in meaning and reality. The forbiddance does not change by changing its name.” (Tahdhīb as-Sunan 5/103 of Ibn al-Qayyim) The seller is not released from the burden of trickery by claiming, “I am not forcing him to take the goods I bought for him.” That is because he knows that the buyer is in need and will not change his mind. That is because the deceitful businessman has ensured that the buyer will not pull out of the pre-arranged deal. This is what many Muslims indulge in, in our times (in Europe and the US) through banks that encourage people with, “Go look for a house that is on sale that you like, and we will buy it. Then we will sell it to you on instalment payments with an increase in profit for ourselves.” So a person finds a house costing $100,000. He informs the bank that he has found a house. The bank buys the house and sells it to him for monthly instalments that amount to $200,000 after ten years. Ibn Uthaimeen stated that these are methods of trickery employed to indulge in ribā (usury). The correct and ethical method for a businessman/company/bank is to buy cars or houses (etc) and own them outright. And then sell them to whoever wants to buy them upon terms of instalments payments, even if there is an increase in price. This method is free of trickery and exploitation and ribā. 15. Student loans in the UK are forbidden (harām) because it is a clear and apparent interest-based (ribā) transaction. A loan is taken from a students loans company and repayments are made at RPI (Retail Price Index) plus 3% interest. RPI is a measure of inflation, and the 3% is what they refer to as interest, usually totalling 6.1% interest. After graduation, this is paid back in instalments over a period of time, as the interest plus RPI is continually being added. This is a ribā (or interest) based transaction and clearly forbidden in Islam by the Revelation and Ijmā’ (consensus). 16. There is no harm in buying a currency whilst it is cheap and then after the price goes up, to sell it. However, this transaction must be performed hand-to-hand (by paying upfront) and not on credit to be paid later or delayed. The exchange must be immediate just like buying gold with silver, hand to hand with an exchange there and then. That is because exchanging currencies take the same ruling as exchanging gold and silver. There is no problem if one pays by debit card (which reaches the seller immediately) or cash during the exchange, as long as it is immediate and not delayed. Likewise, there is no problem if the two who exchange are owners of the currency or representatives of the owners, as long as, a) the exchange is made through immediate payment upfront, b) the increased payment from either side is because the currencies differ (e.g. Dollar for Euro). That is because exchanging $100 USD for $150 USD is like exchanging 2 grams of gold for 3 grams of gold – that is usury and thus forbidden. However, exchanging $100 USD for £80 GBP is allowed and is like exchanging 800 grams of silver for 2 gram of gold. This is permitted as long as it is hand to hand (there and then) and they depart only after the exchange is complete. (Benefits taken from Fatāwā Islāmiyyah, Kitāb al-Buyū’ 2/331 onwards). I took the student loan out for the last few years during my degree, and I have no excuse for myself. Now I have a ~£40k debt on which interest will be added. What should I do?